Chris has been asking for pot roast for a while, so obviously I had to make it for him. 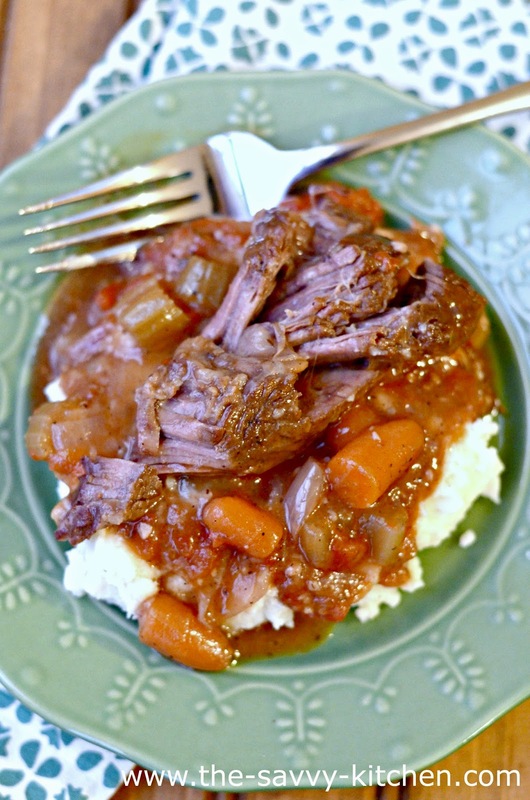 Pot roast is an ideal meal to make in the winter since it's slow cooked all day and helps warms your house (and tummy). Since there are only a couple weeks left of winter, I just had to squeeze this meal in! 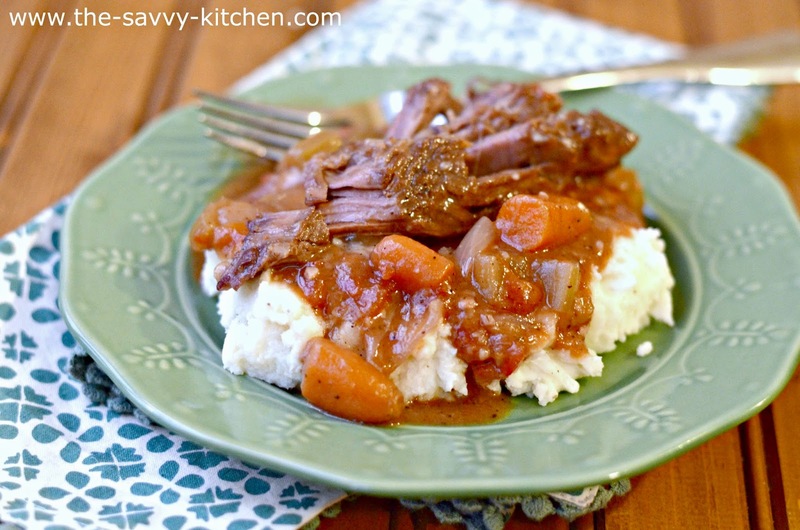 The mixture of flavors in this pot roast are outstanding. Since it cooked low and slow for such a long time, the beef simply falls apart on your fork. Wine, burgandy/cognac and beef bouillon cubes give the roast an intense, rich flavor that meshes perfectly with a heaping scoop of mashed potatoes. It's the ultimate comfort food. Enjoy! Pat the beef dry with a paper towel. Season the roast all over with 1/2 tablespoon salt and 1 teaspoon pepper. Add flour to a large plate and dredge the whole roast in flour, including the ends. In a large Dutch oven, heat 2 tablespoons olive oil over medium heat. Add the roast and sear for 4 to 5 minutes, until nicely browned. Turn and sear the other side and then turn and sear the ends. This should take 4 to 5 minutes for each side. Remove the roast to a large plate. Add 2 tablespoons olive oil to the Dutch oven. Add the carrots, onions, celery, garlic, 1/2 tablespoon salt, and 1 teaspoon pepper and cook over medium heat for 10 to 15 minutes, stirring occasionally, until tender but not browned. Add the wine and Cognac and bring to a boil. Add the tomatoes, beef stock, bouillon cube, sugar, 1 teaspoon salt and 1/2 teaspoon pepper. Tie the thyme and rosemary together with kitchen string and add to the pot. Put the roast and its juices back into the pot, bring to a boil, and cover. Place in the oven for 3 hours for a 3-pound roast, or 4 hours for a 4-5 pound roast, until the meat is fork tender or about 160 degrees F internally. Remove the roast to a cutting board. Remove the herb bundle and discard. Skim off as much fat as possible from the sauce. Place 2 tablespoons flour and the butter in a small bowl and mash them together with a fork. Stir into the sauce and simmer for 2 minutes, stirring until thickened. Taste for seasonings. Slice/pull apart the meat. 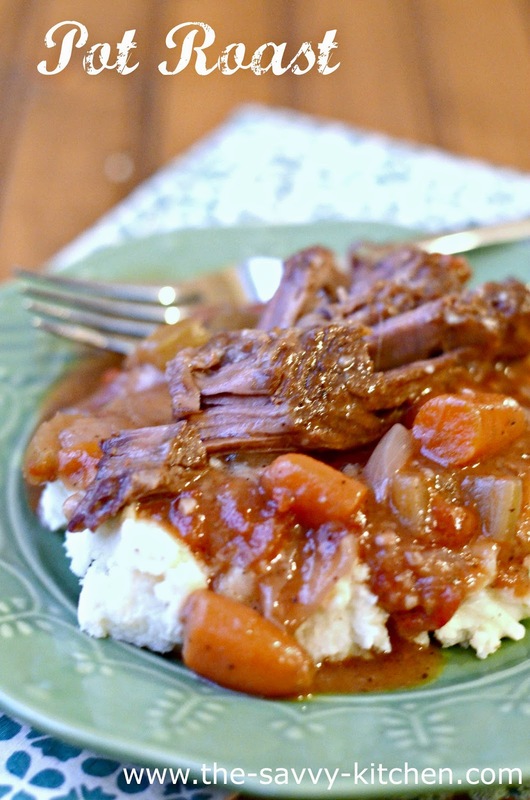 Serve warm over mashed potatoes with the sauce spooned over it.